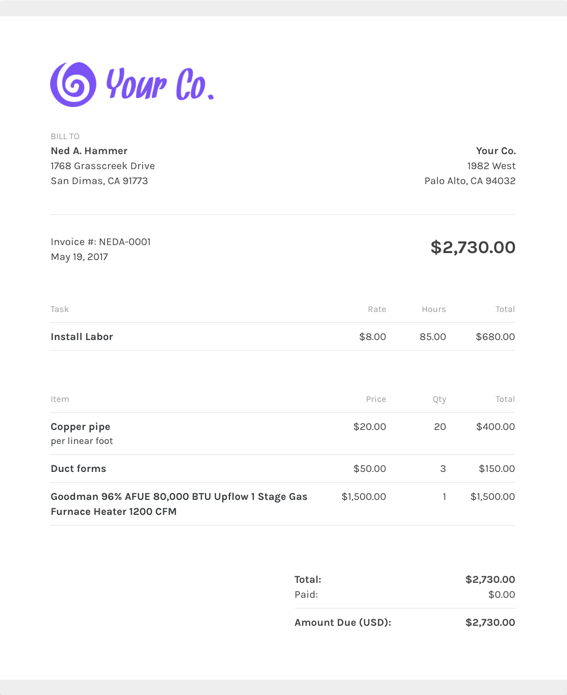 Looking for a towing invoice template that gets the job done? We've got you covered! Do I need more than just a towing invoice template? If you're looking for a basic towing invoice template, you might be settling for too little. Towing companies have to cover a lot of ground, literally. ZipBooks has an iPhone app that lets you create and send out invoices from wherever your job takes you. We know that keeping track of time while you're working is important when it comes to transportation, so why use a separate time tracker and invoice template when you could just use ZipBooks' time tracker that links automatically to your invoice template. Check out what else our template can help you do. What should I include on my towing invoice template? An innovative selling point about ZipBooks is that you can pre-enter all the invoice details into the invoice template. Using ZipBooks for your towing invoice means never sending off an invoice without your own company’s information on it (oops!). We’ve collected data from tens of thousands of invoices and use it to score your invoice based on what information you include so you’ll get you paid faster.